Economic nexus is the idea that a seller becomes liable for sales tax in a state when the total number or value of orders from customers in that state pass a certain threshold. 21 of the states to adopt economic nexus so far have set exactly the same threshold: 200 or more individual sales or a total sales value of $100,000 or more within a year. A few states have higher thresholds and/or additional rules. From each state’s effective date, businesses have to register for sales tax in that state if their sales exceed the threshold. Then the sellers have to charge sales tax on orders to customers in each state where they are registered. They must also file returns and pay the correct tax over to each state. For a full breakdown of effective dates and thresholds for economic nexus, see Avalara’s page on new sales tax rules for remote sellers. Wait a minute. Isn’t this just about South Dakota? Sales tax reform has been a politically charged issue. While ecommerce has exploded, conventional brick-and-mortar retailers have been going out of business on a regular basis. There are several reasons for that, but one is that online retailers can potentially avoid sales tax and traditional store-based retailers cannot. Some online retailers have even promoted their products as sales tax-free, flaunting their position as remote sellers. The online retail revolution has progressed rapidly, while states’ tax revenues have been in freefall. So, the South Dakota v. Wayfair case was not just a spat between one state and a large online seller. It was actually one of several cases lined up by states across the U.S. to challenge the principle that sales tax had to be based on physical presence. South Dakota’s case just happened to be the first to reach the U.S. Supreme Court. 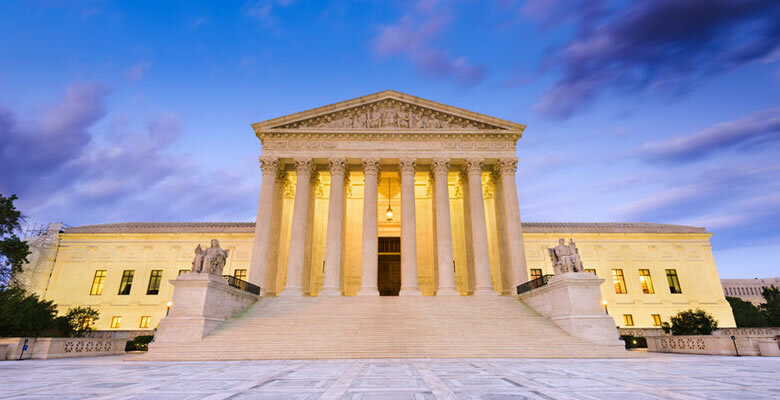 The Supreme Court had ruled in a 1992 case that a seller had to have a physical presence in a state to create a sales tax liability there. Only the highest court in the land can overturn its own past rulings, so getting a case there was the only way for the states to untie their hands. Now the genie is out of the bottle, and other states could follow at any time. When does economic nexus come into effect? Several states brought in economic nexus from July 1st, 2018, just ten days after the Supreme Court’s ruling. Today, economic nexus is in effect in 15 states, and will come in for a further 12 states by January 1st, 2019. Tennessee and Wyoming introduced economic nexus before the South Dakota decision, and have to overturn state-level injunctions before it can take effect. This is not an area where being the first-mover is an advantage! What do online sellers need to do about economic nexus? Economic nexus hasn’t changed sales tax completely, it has just added a new way that sales tax liability can be established. If you are already on top of your sales tax obligations, you’ll just need to “add in” economic nexus and check if it makes you liable in any additional states. If you’ve never looked into sales tax outside your home state, you’ll need to start from scratch. The first step is to determine if your business is liable to sales tax (or “has nexus”) under each state’s specific rules. Physical presence has not gone away, even for the states that have introduced economic nexus, so you’ll need to look at both. Unfortunately, physical presence is not as straightforward as it sounds. The definition has expanded considerably over the years, so you can have nexus without any premises or people in the state. Physical presence rules vary widely between states. Some will look at inventory and affiliates, for example, while others will only consider premises and people. In principle, economic nexus is simpler than physical presence. It’s just down to the thresholds, in all but a few states which have additional rules. You will need to look at your business over the past year, and calculate the total number and value of sales to each state. Once have exceeded the threshold, you will have nexus in that state and will need to register for sales tax. If you sell through multiple channels, you will need to calculate the total sales for each state across all the marketplaces and websites etc. that you use. 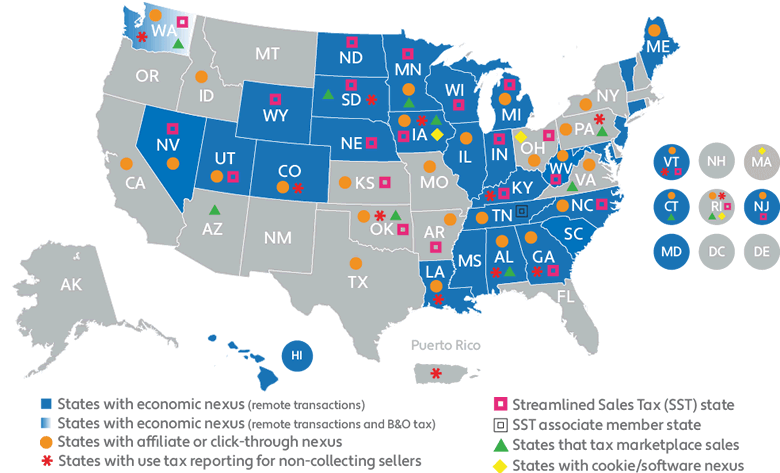 If you already feed that data into an accounting or inventory management system, or a sales tax system like Avalara, you should be able to report quite easily on sales by state. This first step of figuring out where you have sales tax nexus is a complex legal matter and can be confusing. Work with your CPA or a sales tax expert to make sure you have understood all the rules correctly. Avalara also provides professional services to help sellers determine where they have nexus. You will need to register for sales tax in each state where you have nexus. It’s up to you to complete the process, which is different for each state. For some, there are paper forms to file, and for others the process is electronic. The forms themselves also vary, although they ask for a lot of the same information. You can register directly with each state, or use Avalara Licensing, which helps sellers find and file the correct forms. Sales tax has to be collected from customers at the point of payment. So, if you have your own online store, such as Shopify or BigCommerce, you will need a technology solution which calculates the correct sales tax based on your business situation and the buyer’s location. Some shopping carts have their own built-in sales tax engine, although these are not accurate in every situation and may have limited configuration and reporting features. Avalara’s AvaTax is a tax calculation plugin with over 600 pre-built integrations, including ecommerce platforms, ERPs and its own API. It provides real-time tax calculations based on the buyer’s exact location (not just ZIP code) and can easily export data ready for use in returns. If you only sell through online marketplaces like Amazon and eBay, they will calculate the sales tax on checkout. However, you are still responsible for filing returns. More on that below. The last step of the process is filing returns to each state and, of course, paying over the tax. Filing can be quarterly, monthly, bi-monthly, or annual, depending on the state and the level of your sales there. You can file directly with each state, or a return preparation and filing service can save time and ensure accuracy. Most importantly, a service can help make sure that you file and pay your taxes on time. As for all taxes, failure to pay the right amount of sales tax, to the right authority, at the right time, can lead to financial penalties and legal action being taken in serious cases. 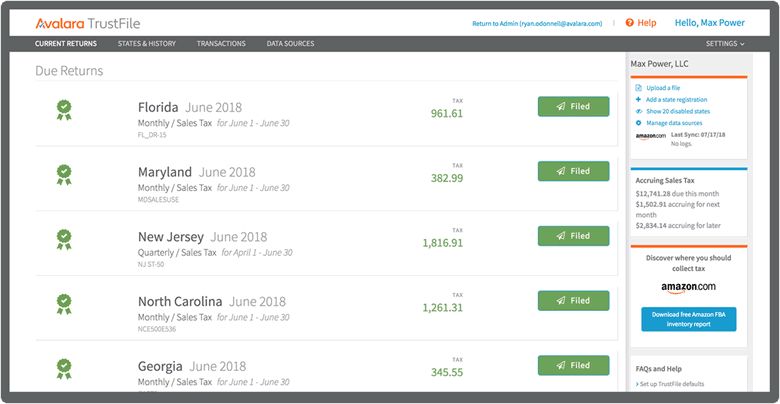 If you use AvaTax to calculate sales tax in your shopping cart, Avalara Returns connects to it and makes returns preparation and filing straightforward. If you only sell through marketplaces, TrustFile has been specifically designed to pull sales tax data from multiple marketplaces and shopping carts, prepare returns and file them automatically. It even sends reminders so you don’t miss deadlines. TrustFile is a particularly good fit for Amazon sellers using FBA. Amazon will often send inventory between FBA warehouses in different states, making it hard for sellers to track where their inventory is stored, and creating sales tax nexus in multiple states. On top of that, 12 states now have laws specifically targeting marketplace sales. These rules vary widely, but they can create additional sales tax obligations for sellers. Some even require Amazon (and other marketplaces) to provide the names and addresses of retailers making sales to customers in their state. South Dakota’s official state song is a fitting theme for the revolution happening in sales tax… if only for the 28 other states that have quickly followed in its wake, and introduced economic nexus rules of their own. Economic nexus has very squarely addressed the unfair advantage online retailers have had over brick-and-mortar businesses. But it has also burdened hundreds of thousands of small business owners across the country with new obligations and administrative headaches. Sellers who have never set foot outside their home state can now easily find themselves liable to sales tax in a dozen or more states. Economic nexus, for all its fairness to brick-and-mortar retailers, is just one more thing making life hard for small business owners. The answer? Get expert help, use software, and automate the process as far as possible. When faced with something you just have to do, the best response is to do as little of it as possible. Then you can concentrate on the things that really make a difference to your business. This post is for informational purposes only. For specific business advice, contact a sales tax expert. This post was sponsored by Avalara. In addition, if you are based in the UK and meet or exceed any of these economic nexus thresholds (unique for each state) listed on this page, you may need to consider which states you’ll need to register in. On the flip side, if you’re based in the UK and only sell within the UK, you likely don’t need to worry about these nexus triggers for remote sellers.